The kaavad of Rajasthan is a portable shrine with multiple doors that fold into themselves. The Kaavadiya Bhat or the storyteller journeys with this brightly painted wooden box to the homes of his patrons, to recite their genealogies and regale them with the stories of the pantheon of deities painted on the shrine. While the object serves as an aide – memoire for the storyteller, the keeper of its secrets his tales are meant to reaffirm the lineage of his patrons and their exalted place in the community. It is a tradition that binds communities in common memory and mythology. Where did it come from? What is its fate in the world today? Exploring a panel at a time of this curious mnemonic device, its author, Nina Sabnani, leads as on a journey to uncover the myths and mysteries of this unique oral storytelling tradition. Nina sabnani is a storyteller who uses film, illustration and writhing to inform and enlighten her audience. Her research interests focus on exploring the dynamics between words and images in storytelling. As a filmmaker, she brings together animation and ethnography in old and new ways. Her published stories are often rich collaborations with artists and folk fablers and have earned critical acclaim. Nine graduated from the Faculty of Fine Arts, Vadodara, and received a master's degree in film from Syracuse University, NY, which she pursued as a Fulbright fellow in 1997. Her doctoral research at the IDC focused on Rajasthan's Kaavad storytelling tradition. She taught at the National Institute of Design for 22 years before moving to Mumbai in 2006. Nina draws inspiration from her students at the Industrial Design Centre, IIT, Bombay, Where she teaches and coordinates the PhD Programme. In our great text, the Bhagavad Gita, there is description of an imperishable tree, which is said to have its roots upward and its branches down: urdhva mulamadhab-shakham. The text then moves, as a matter of course, in a philosophical direction and adds a little later: "The real form of this tree cannot be perceived no one can understand where it ends, where it begins, or where its foundation is. When one comes to think about it, this not true of a great many things in our land-idea, institutions, practices – for who knows where they end or begin, or where their foundation are? We see them every day, follow them, put them to use are in fact surrounded by them. But somewhere we also know that their roots are in that undefined air above us, with their capillaries stretching out, gathering and garnering, in all possible directions. To speak of these things in the context of a simple device called a Kaavad – or of others like wooden puppets and Pictorial scrolls – might sound a bit excessive. 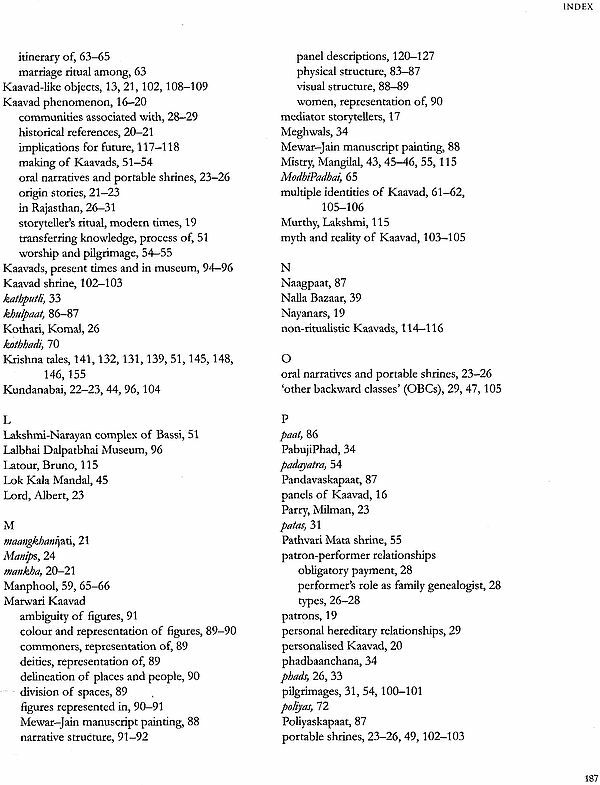 But if one sees with Nina Sabnani's eyes, and begins to track this Portable shrine' in the manner in which she does, one finds oneself journeying through a land of liminal spaces, those that are 'betwixt and between' entering – together with carpenters and bards and storytellers – a timeless world, in which their clients can mingle with gods and animals and plants, and of course their ancestors. Some things reveal themselves, others stay hidden, still others one can dimly peer into, Panels slide; secret doors open; sights appear. There is a brush with history; social structures are explored; the meaning of it all sought to be unravelled. And attached to it everywhere there are stories of the kind that our land is so blessed with: stories of charity and of hardships, of need fulfilment and divine justice. As Nina points out, one can get completely immersed in them, for they wash over you time after time. However, there are questions that a sustained and serious inquiry, such as this, throws up too. Does the Kaavd – or similar devices and practices – have a chance of survival in our fast – changing, fast – moving world? There are no easy answers. But perhaps one should, for hope, turn to a story that the Kaavad makers and reciters speak of with great relish, even reverence. 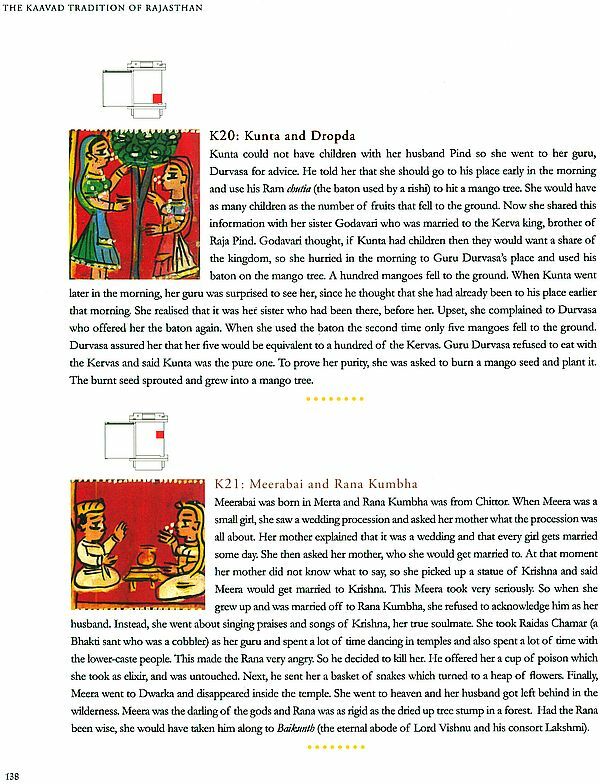 It is the story of Kundanabai, a devout Brahmani from Kashi. Because of her intensely devout nature, she received from the gods the boon of immortality – but immortality with a difference. Each morning, in terms of the boon, she would start as a small child; in the course of the day she would turn into a young woman at night she would become an old lady again. One wonder if this is happening, or may possible happen to our traditions and our practices – that they will keep changing, ever renewing themselves, but not die? Nina Sabnani's book on Kaavads is a culmination of her sustained engagement with several facets of this very interesting tradition of storytelling. Her book, academically rich and extremely reader friendly, is a rich amalgamation of texts and images, histories and narratives, personal accounts and sociological analysis anthropology and cosmology, and much more. 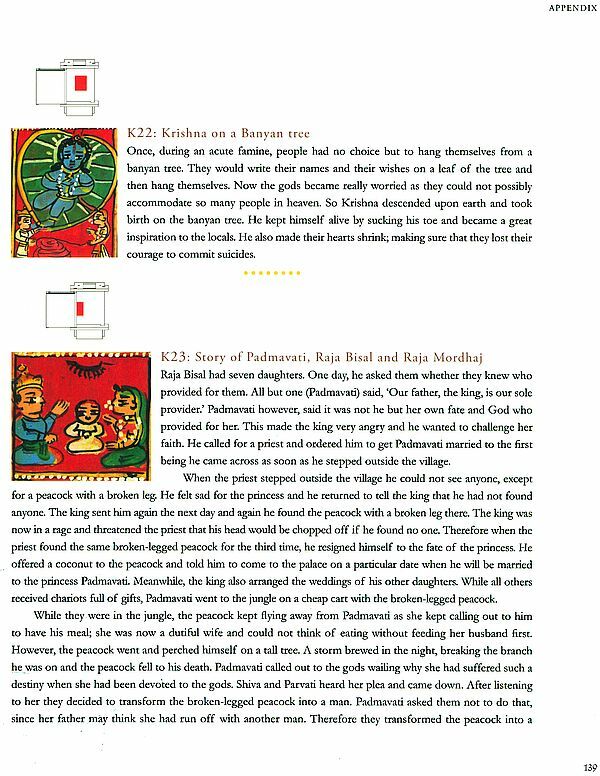 In her well – researched book, Nina goes on to trace a whole tradition of itinerant storytelling related to the Kaavad. She traces a genealogy of storytelling and performance related to it and comments on the tradition of oral storytelling and memory making. 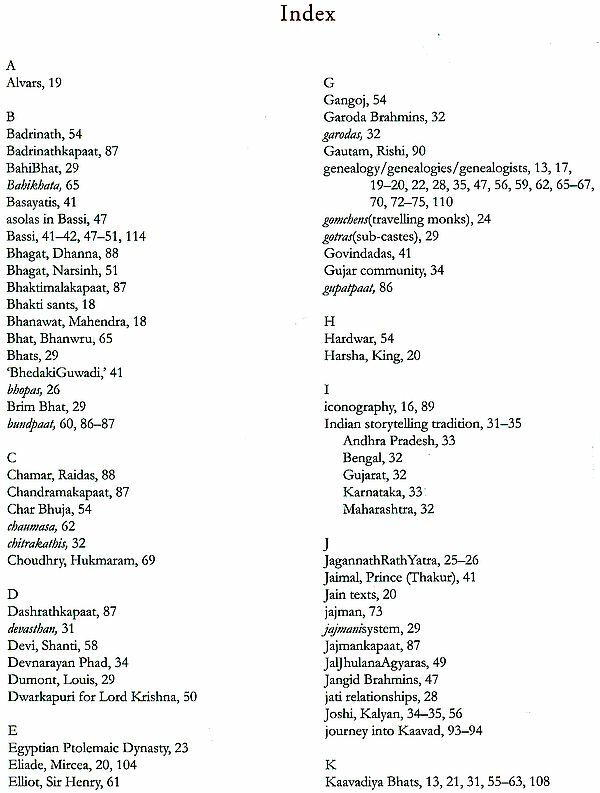 While she meticulously deconstructs the anatomy of the Kaavad and comments on the significance of each of its elements, she also traces the repertoire of stories related to it. The rich sources that this oral tradition of storytelling makes use of, the cosmological and the anthropological universe of these stories are all discussed in great detail by Nina in her work. She examines the ritual significance as also the performative aspects of the art of storytelling with great care in her analysis. 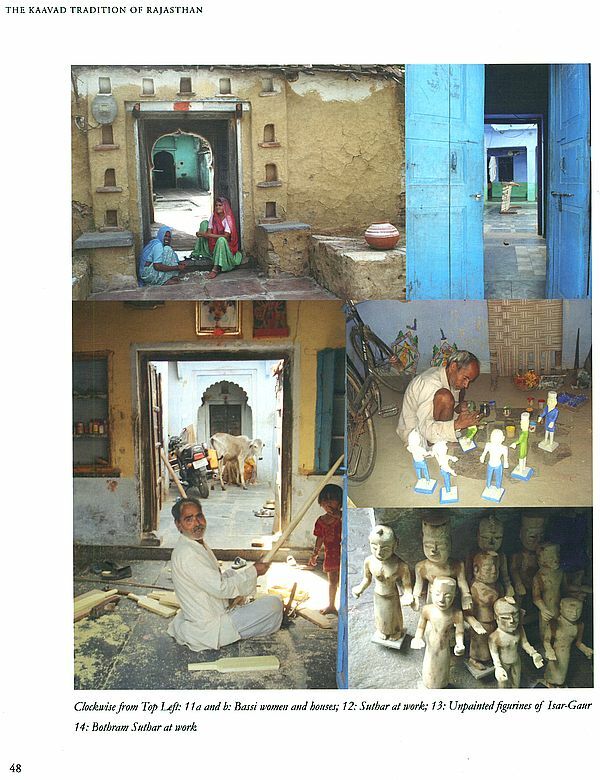 Her account which is told through individual lives and narratives, traces the community of Kaavad makers as also that of the storytellers, who are the custodians of this very significant tradition of storytelling and performance. She discusses the system of patronage, the state of the community today and the challenges that it faces, with a sharp concern for the sustenance of both the form and the community. 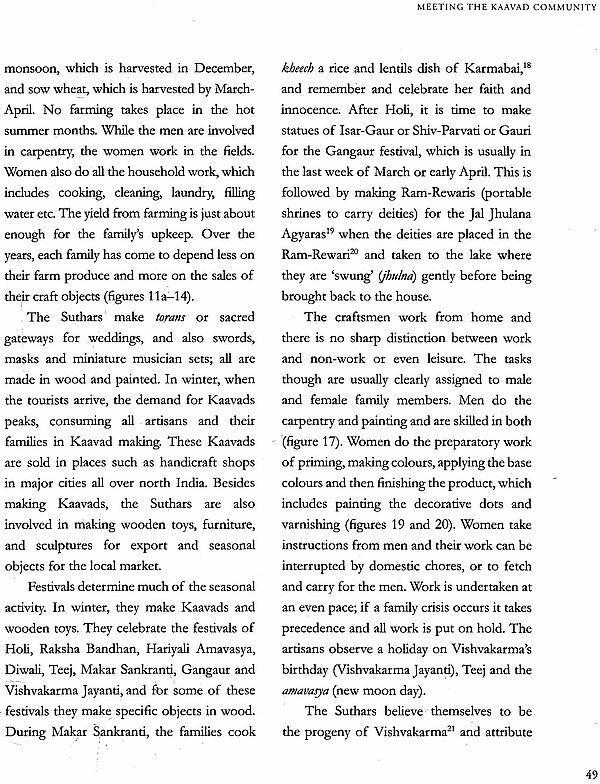 Nina's work on the Kaavads is truly a commendable work which tries to cover all aspects of the form with great care. Her painstaking research field trips, interviews, photographs, rich visuals all make for an instructive and delightful read. Her own insights into the phenomenon are particularly insightful. Nina's extremely important intervention in the field of folk art and tradition can be an inspiration to many. The Kaavad Storytelling of Rajasthan is an important part of the oral tradition of the regions of Mewar and Marwar. 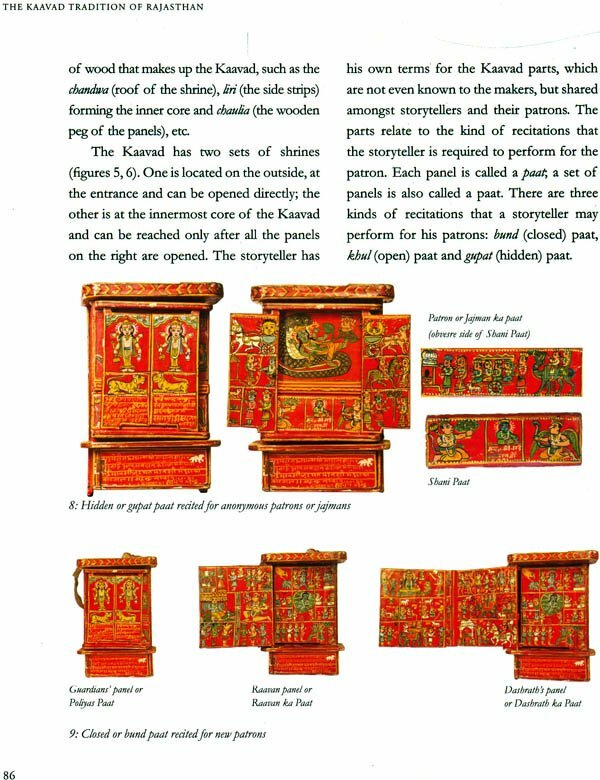 A portable, painted, wooden shrine, a Kaavad is made by the Basayati Suthars (kaavad makers) of Bassi, Chittor, for the Kaavadiya Bhats or Ravs (storytellers) of Marwar. 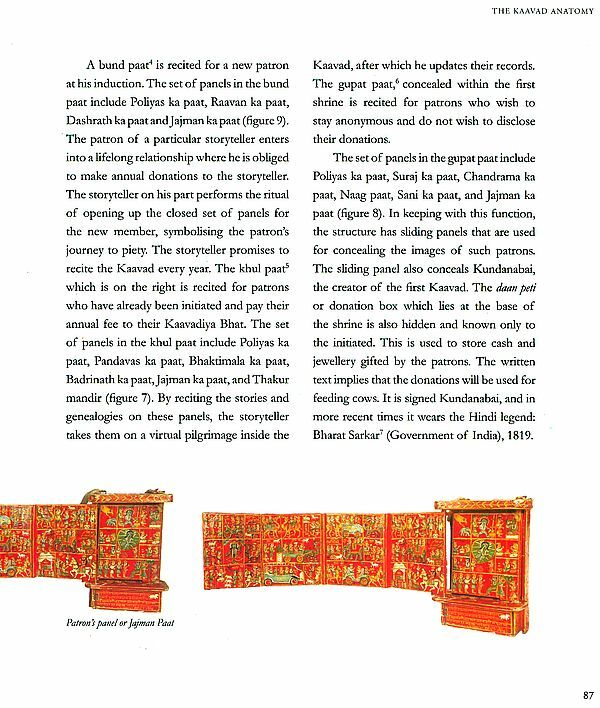 The storytellers use the unique technique of unfolding multiple panels of the Kaavad to recite religious stories, and also genealogies for their jajmans or patrons, across Rajasthan and its adjoining states. The choice of the Kaavd – storytelling phenomenon provides an opportunity to study an object which has multiple societal and design functions, as well as to examine the interplay between the Kaavad object, the storytelling, performance and its reception. In addition it occasions the documentation and understanding of an important living, oral storytelling tradition that has received little attention so far. The questions this seeks to answer is what purpose the kaavad serves and what it mean to the community concerned. The Kaavad recitation includes simulating an experience of a travel; a journey not unlike a pilgrimage. As the storyteller recites the genealogies of their patrons, in a myth making exercise, it is noticed how it rends to elevate their status by connecting them to ancestors who are heroes with divine connections. This books aims to arrive at an understanding of the role of the designed object, and to investigate how its design contributes to the experience of a pilgrimage and in the construction or elevation of the patron's personal status.